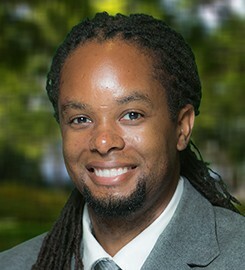 Christopher Carter’s teaching and research focuses on philosophical and theological ethics, Black and Womanist theological ethics, environmental ethics, and animals and religion. He approaches religious studies as a liberation ethicist committed to exploring how the moral economy of U.S. religious thought and culture impact the everyday lives of marginalized populations, particularly African American and Latino/a communities. He is active in the leadership of the American Academy of Religion where he serves as a steering committee member of both the Religion and Ecology and the Animals and Religion Group. Professor Carter is also a pastor within the United Methodist Church and currently serves as an assistant pastor at Pacific Beach United Methodist Church. Professor Carter teaches courses in Christian theology and ethics, Black and Womanist theology, and Christianity and environmental justice. His passion for teaching evolves out of his experience growing up in poor and marginalized communities. To this end, he believes that education is the practice of freedom and that the process of learning should be transformational: it should transform how the student views herself, her neighbor, and her place within the world. Submit changes to Christopher Carter's profile.